What’s New For 2016? Fewer New Insecticides On The Horizon & Continued Insecticide Losses. The Food Quality Protection Act (FQPA) is celebrating its 20th year anniversary in August. Since the passing of FQPA in 1996, the mandate to develop a health-based standard for pesticides used in foods has seen some losses of older insecticides that had a negative impact on human health. Of equal importance, this dramatic shift provided incentive for the industry to provide ecologically sound pest management tools for Eastern US farmers to produce the safest food ever grown, insecticides more benign to native pollinators and softer on the environment, many of which more effective then their counterparts. Prior to FQPA a residue tolerance level for a pesticide was set at 1/100th of the ‘no observable effect level’ (NOEL) when insecticides are tested in laboratory animal studies. FQPA legislation added an additional ten-fold safety factor incorporated into pesticide residue levels to safeguard children who are at greatest risk to residual concentrate. Limiting pesticide residue through assessment of the total or “aggregate” exposure to pesticides in diet plus exposure to pesticides in drinking water and all other non-occupational sources, such as pesticides used around the home and on lawns and pets are taken into account through FQPA. 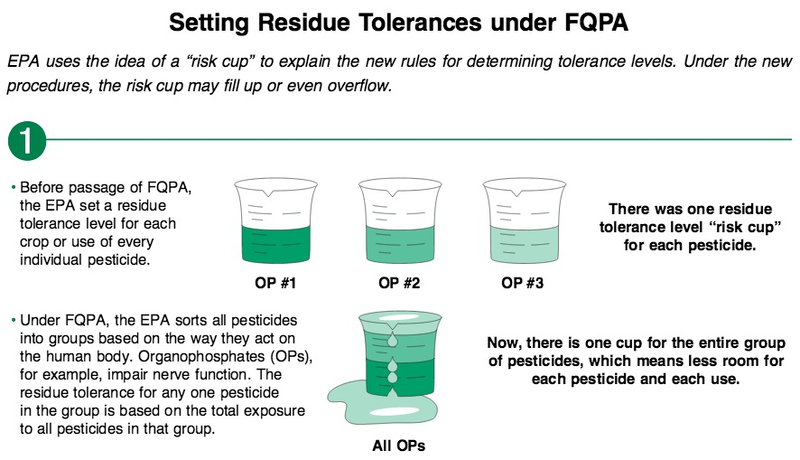 When all sources of pesticide exposure are totaled, the ‘risk cup’ of a pesticide class fills up, requiring reduced use if the cup exceeds tolerances of pesticides in the same class or that act on human health in the same way. Since 1996 we have seen reductions in the number of older insecticide products in the tree fruit industry for EPA to comply with FQPA legislation. The older insecticide classes that were developed in the 1950’s and 60’s, such as chlorinated hydrocarbons, organophosphates and carbamates, were among the first insecticides to be restricted or banned. In apple production these included the loss of methyl parathion and azinphos-methyl with reductions in use placed on chlorpyrifos. This year all registrations for endosulfan based products, which are the last of the chlorinated hydrocarbons will be canceled. These include the products Thionex / Endosulfan 3EC & 50W, registered for use in apple. Endosulfan was mandated by EPA for a stop-use date of March 31, 2016. A well written piece on FQPA can be found on the NC State IPM site. The possible loss of chlorpyrifos registration has become a concern for the tree fruit industry. For apple growers the use of chlorpyrifos (Lorsban) has provided a unique mode of action for resistance management to maintain control of OBLR, San Jose scale and dogwood borer. It has also been shown in preliminary studies to be effective on controlling the black stem borer, a forest insect pest in the ambrosia beetle family, attributed to the recent decline and death of hundreds of apple trees in dwarfing high-density plantings in NY. The EPA was required by the 9th Circuit Court of appeals to propose the revocation of all chlorpyrifos tolerances based on the ‘science as it stands’ with an anticipated release of the final rule in December 2016. see ‘EPA Proposal to Revoke Chlorpyrifos Food Residue Tolerances’ for more details. Amendments to FQPA include increasing assessments to environmentally sensitive issues pertaining to both new and older pesticide registrations. The newly developed ‘reduced risk’ materials, including the neonicotinoid class, have been under investigation recently, having been identified as potential contributors to Colony Collapse Disorder. Concerns over honeybee decline and pollinator conservation along with ground water contamination in certain watersheds are targeting newer insecticide classes once considered a safe alternative to older chemistries. The neonicotinoid class, a replacement for materials in the carbamate and organophosphate groups, are much less toxic to birds and mammals. The loss of these tools would weigh heavy on tree fruit production practices. A few examples of newly lost reduced risk insecticides include Calypso SC and Closer. Bayer Crop Science voluntarily canceled the registration of Calypso SC, a neonicotinoid (Thiacloprid) in 2014, believed to be due to ground water concerns. Thiacloprid was considered to be an excellent replacement for azinphos-methyl due to its very low toxicity status to honey bees and effective control of plum curculio shortly after bloom. Remaining product can be used through the end of 2016. Closer is a recently developed insecticide from Dow AgroScience with the active ingredient Sulfoxaflor in IRAC 4C, a class of neonicotinoid. This insecticide demonstrates efficacy against the aphid complex including wooly apple aphid and leafhopper. It had its EPA registration revoked in September 2015 by the 9th Circuit Court of appeals in California citing bee safety concerns. Dow is currently restructuring the product package hoping to resubmit to EPA for registration this year. Bayer Crop Science is presently defending the registration of Belt SC, a newly developed product effective against leafrollers and species of internal worm. EPA has requested the voluntary withdrawal of Belt due to concerns for aquatic species, residual persistence in the environment and resulting metabolite toxicity. EPA has issued a time-limited registration to Bayer CropScience and Nichino America for flubendiamide to collect additional data on the potential impact of the product to degrade in the environment. Although there are losses of materials mentioned above, many products remain available for use in tree fruit pest management. It remains clear that a number insect species require multiple applications for each of two or three generations each season. This will require two to three modes of action of effective insecticides, one for each generation, to achieve pest control and maintain product effectiveness. That said, many classes of insecticides are needed for each insect to counter insecticide resistance to any one product. The agrichemical industry will be hard pressed to kept up the pace in insecticide development to counter product losses over the coming years. Consolidation and merger of companies over the past 30 years has reduced the overall number of Agrichemical companies conducting R&D on new products. The largest merger between Dow and DuPont is just beginning. While new active ingredients are being screened for efficacy against insect pests, the requirements for active ingredients to be pest specific, soft on predators, safe to humans and non-target organisms and benign to pollinators is no small order for insecticide developers in search of ‘safer poisons’. To add to this insecticide registration dilemma, agrichemical companies are faced with ever increasing research and development costs, requiring on average 164 million dollars and 9.8 years between the first research tests and authorization of a single product (European estimates). The new product pipeline for effective insect pest management will be further challenged if effective insecticide classes continue to be targeted or withdrawn from the toolbox. Recent losses of tree fruit tools reduce our ability to develop viable pest management solutions. With fewer effective active ingredients it has become increasingly important that resistance management is being practiced. Employing a unique active ingredient with a different mode of action for each insect generation in pest management programs will be critical. So, on a more positive note, there are a number of insecticides that have launched over the past year or so with EPA registrations for tree fruit use, three of which are available for use in NY State, with two products prohibited for use in Nassau and Suffolk counties. Envidor 2SC (spirodiclofen) from Bayer CropScience is a new miticide under a NYS DEC FIFRA 24(c) Special Local Need label for for use against European red mite and Twospotted spider mite on pome fruit. A maximum of 1 application per season is allowed. Prohibited for use in Nassau and Suffolk counties. Exirel (Cyantraniliprole) from DuPont is in IRAC Group 28 belongs to the Diamide class of insecticides, which activates ryanodine receptors, depleting the internal calcium within the insect to prevent muscle movement. Exirel is now registered in pome and stone fruits, grapes and blueberries yet prohibited in Nassau and Suffolk Counties. Labeled uses for a range of pests including leafrollers, codling moth, oriental fruit moth, grape berry moth, fruitworms, Rhagoletis and Drosophila fruit flies, aphids and leaf-feeding beetles. Madex (virus isolate V22; Cydia pomonella granulosis ) from Certis USA, was registered for use in controlling codling moth and oriental fruit moth in NYS pome and stone fruit crops. The active ingredient virus isolate V22, has activity against both of these tortricid pest species, is harmless to natural enemies and is OMRI approved for use in organic production. Sivanto (flupyradifurone ) from Bayer CropScience is in IRAC subgroup 4D, a neonicotinoid and the first insecticide in the butenolide chemical class. Sivanto is locally systemic, moving from points of contact to leaf tips in the case of foliar applications. Labeling includes aphids (except Woolly apple aphid), leafhopper, San Jose and oystershell scale, pear psylla. It has a honeybee-safe profile. Not yet labeled in New York. Nealta (cyflumetofen) from BASF is in IRAC Group 25 is a member of the beta-ketonitrile class of chemistry. The material is labeled on a variety of crops, including apples, pears, strawberries, grapes and almonds for managing spider mites. Effective against European red and two-spotted spider mite and compatible with beneficial mite and insects with a short pre harvest interval. It provides knockdown and residual control of tetranychid mites on the crops as a contact miticide on egg, nymph, and adult stage. Nealta is not systemic and has no translaminar activity, ineffective on non-tetranychid mites such as rust mite. Not labeled in New York. Apta (tolfenpyrad) is a new insecticide from Nichino belonging to the IRAC Group 21A, Mitochondrial Complex I Electron Transport Inhibitors or METI class, which work by inhibiting cellular respiration in the mitochondria. Apta is registered in stone fruits for control of a range of pests including leafrollers, leafhoppers, plum curculio, Rhagoletis and Drosophila fruit flies providing suppression of the spotted wing Drosophila. The maximum yearly amount of Apta that can be applied is 54 fluid ounces in stone fruits with a 14-day pre-harvest interval (PHI). Not yet available in New York.